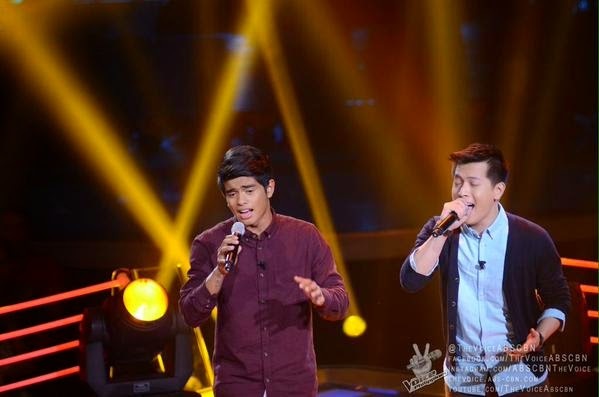 MANILA, Philippines - Team Sarah's artists have clashed on "The Voice Philippines" The Battles Round on Saturday, December 6, 2014 with Daniel Ombao and Jason James performed Boyz II Men hit "On Bended Knee." Coach Lea and Apl were impressed by Jason while Bamboo picked Daniel as the best among the paired artists. Coach Sarah declared Jason as the winner in the battles round. He will advance to the next round of the competition – the Knockout rounds. On Sunday (Dec 7), the Battles round continues with Team Sarah’s Kokoi Baldo vs Elmerjun Hilario (“To Be With You”) and Shaira Opsimar vs Monique Lualhati (“Lady Marmalade”), Team Lea’s Mark Avila vs Mark Cando (“This I Promise You”) and Humfrey Nicasio vs Leah Patricio (“Forever”),and Team Bamboo’s Ramonne Rodriguez vs Lougee Basabas (“To Love Somebody”). The first episode of The Battles on Saturday dominates online conversations with '#BattlesPH' among the trending topics.